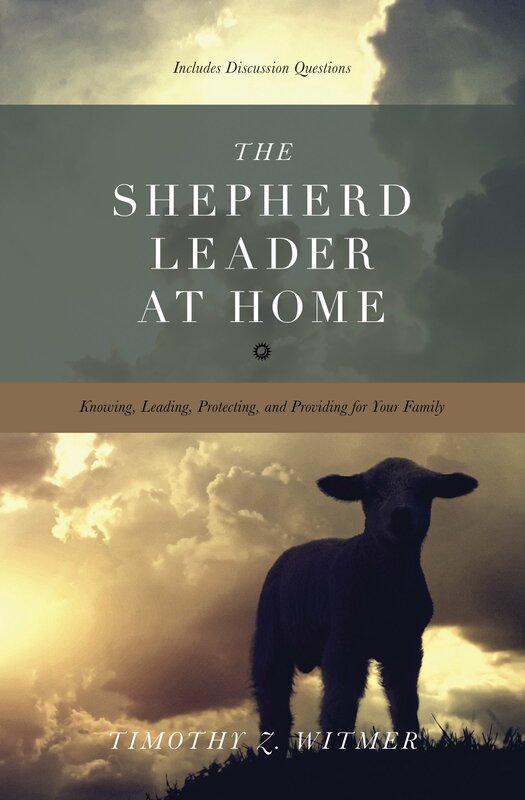 The Shepherd Leader at Home by Timothy Witmer (Wheaton, IL: Crossway, 2012). Marriage is not in trouble. Perhaps this statement seems bizarre, especially given the amount of discussion surrounding marriage in secular and Christian circles. Isn’t marriage what all the fuss is about these days? Sure, but from the Christian perspective, marriage cannot be in anymore “trouble” of disappearing, or being redefined, than the law of gravity. God has made the thing, defined it, and graciously given it to His creatures for His glory. The rub comes in when, by rebellion against God’s law, men perish for lack of knowledge (see Isa. 5:13). The law doesn’t change any more than God changes, but in our sin we reject God’s plan and purpose for our lives, suffering the tragic consequences. In this short little book, Dr. Witmer writes clearly and honestly to husbands and fathers about their God given task of shepherding their little flocks. The shepherding motif runs throughout Scripture, and Dr. Witmer applies it aptly to the home. The book is broken down into four main categories, which follow the four main responsibilities of the shepherd: knowing, leading, providing, and protecting. The man of the house is to take responsibility in each of these categories, not as the sovereign lord of his home, but under the law and guidance of his Great Shepherd, who laid down His life for His sheep (see John 10:11). Truth be told, oftentimes the most obvious things are often overlooked. Dr. Witmer discusses many different aspects to knowing ones family. He explains how foundational this knowledge is, for if a man does not know his wife and kids, how can he lead them, provide for their needs, and protect them from danger? Knowledge requires presence. In order to know about someone intimately, you must spend time with them. You must pray with them, discuss their needs and weaknesses, and be able to build them up for their strengths. All of these things require time. Make it. Nothing, husbands, should be a higher priority than spending quality and quantity time with your family. When husbands take the time to know their wives well, they are speaking truth about the way Christ relates to His church. He knows His sheep, and He leads them in paths of righteousness (see Psalm 23, John 10:14). Both the husband and wife have different roles and responsibilities within the marriage covenant. Dr. Witmer necessarily, and wisely, reminds us that it “is a grave error for a husband to misconstrue his place of leadership as a position of superiority” (Kindle Location 1028). The role of the husband is to lead his family toward the glorious end of worshipping and obeying God. He can do this for no other reason than that he is himself being brought along by the Great Shepherd in the paths of righteousness (see Psalm 23:3). Christ loved the church by laying down His life for her; husbands, your “number-one responsibility, humanly speaking, is to love your wife to the extent that she has absolutely no doubts about it” (Kindle Locations 1138-1139). Husbands, one major way in which we lead our families is by example. This is a heavy burden, but one in which God is gracious to strengthen us for. Because of the first principle of knowing, there are serious implications here. Our wives know us better than anyone, do we want them to follow our example? Do we want our children to respond the way we do? Certainly, if anything, this means we must lead by example in asking for forgiveness. A good husband will not be a perfect husband, but rather one that seeks to lead his family into the grace of the Lord Jesus, and submit to His authority. Men generally just know they are responsible to work and provide materially for their families. Even when, for whatever reason, men abdicate this responsibility they feel it. More often than not, however, the husband and father’s obligation to provide spiritually for their flock is neglected—to the harm of the entire family. God has ordained men to lead their families in worship and the study of the Word. Simply taking your family to worship on the Lord’s Day is not sufficient here—husbands are to be creating Scripture saturated homes where their flocks can be nourished in the Lord. This takes time and diligence. How often do you read the Word of God with your family? How often do you pray for the family needs with your family? Praying for needs with the family is important, and it helps teach the family that God is the ultimate source of all things that you have. The Good Shepherd is the ultimate provider for His sheep. Dr. Witmer wisely recognizes that inappropriate sexual desire, found within the heart, is “one of the greatest dangers to your family” (Kindle Locations 1728-1729). This section of the book is direct straight-talk to husbands on this important issue from the book of Proverbs. Adultery is a serious issue within the church, and it has devastating consequences in families. The first step, husbands, is protecting your own hearts from this gnawing evil. Are you guarding your heart? Are you taking steps to prevent temptation, and to bolster your defenses for when it comes? Memorize Scripture. Be vigilant. The role of a husband and father extends beyond this, especially in regards to children, and includes the father protecting his children from worldly influences that will lead them astray. At this point, the previously established discipline and nurture in the Word of God becomes essential. Children must learn what God requires in His law, and what the consequences are for neglecting God’s word. Discipline must be brought about consistently, with love toward the child that they may learn to live in accordance with God’s word for His glory. Dr. Witmer brings a helpful, practical contribution to the Christian bookstore on marriage. Since the issues surrounding marriage are vast, and the teaching of the Scriptures on this subject often neglected, this contribution is good and necessary. One book cannot possibly cover all the ins-and-outs of the husband’s role in his marriage and family. Read more than this book, but read this book none the less. Dr. Witmer brings a refreshing approach to the issue by applying the shepherding motif from Scripture, as well as many personal anecdotes and pieces of “learned” wisdom. Better to learn by sound counsel than by personal experience; the stakes in this one are high. This entry was posted in Book Reviews and tagged Christian Marriage. Bookmark the permalink.